The renin-angiotensin-aldosterone system (RAAS) regulates BP and salt-volume homeostasis. Juxtaglomerular (JG) cells synthesize and release renin, which is the first and rate-limiting step in the RAAS. Intense pathologic stresses cause a dramatic increase in the number of renin-producing cells in the kidney, termed JG cell recruitment, but how this occurs is not fully understood. Here, we isolated renal CD44+ mesenchymal stem cell (MSC)–like cells and found that they differentiated into JG-like renin-expressing cells both in vitro and in vivo. Sodium depletion and captopril led to activation and differentiation of these cells into renin-expressing cells in the adult kidney. In summary, CD44+ MSC-like cells exist in the adult kidney and can differentiate into JG-like renin-producing cells under conditions that promote JG cell recruitment. The renin-angiotensin-aldosterone system plays a key physiologic role in the regulation of BP, electrolyte homeostasis, and kidney development. The first and rate-limiting enzyme is renin, an aspartyl protease synthesized and secreted into the circulation by highly specialized endocrine cells named juxtaglomerular (JG) cells that line the afferent arteriole of the kidney. Despite the physiologic importance of these cells, the molecular factors responsible for the development and maintenance of the JG cell identity remain unclear.1,2 Moreover, in response to specific pathophysiologic conditions that demand a significant renin response (i.e., chronic ischemia, prolonged adrenergic activation, and sodium depletion), the number of renin-expressing cells in the adult kidney increases dramatically. It has been suggested that this increase is potentially due to the transdifferentiation of existing arterial smooth muscle cells.2–4 Still, the complete cellular and genetic mechanisms underlying this phenomenon, known as JG cell recruitment remain poorly understood. Our group recently demonstrated that liver X receptor-α (LXRα) agonists and/or cyclic AMP (cAMP) upregulated renin expression in both murine and human bone marrow–derived mesenchymal stem cells (MSCs) in vitro. Stimulation of cultured murine MSCs that overexpress LXRα also resulted in their differentiation into JG-like cells expressing renin and α-smooth muscle actin.5,6 These MSC-derived JG-like cells contained renin in secretory granules and were capable of releasing renin.5 Interestingly, accumulating evidence suggests that stem cells/progenitor cells reside in the adult kidney (Supplemental Table 1),7–10 although their physiologic importance is not yet clear. On the basis of the preceding findings, we investigated whether adult kidney stem or progenitor cells have the capacity to differentiate into JG-like cells or contribute to JG cell recruitment. For this we performed in vitro and in vivo differentiation assays as well as lineage tracing using genetic models. To investigate the presence of stem cells/progenitor cells in the adult kidney, cells were isolated from kidneys of adult male C57BL/6 wild-type mice and analyzed using flow cytometry for the presence of the typical tissue stem/progenitor markers c-kit (CD117), CD44, CD90, and CD105. This analysis revealed that approximately 5% of these freshly isolated cells expressed at least one of the assayed markers. The majority of cells positive for the CD44 marker were also positive for c-Kit, CD105, and CD90. The overlap between the CD44 expression and the expression of c-Kit, CD90, or CD105 was approximately 70%–90% (Figure 1A). CD44+ MSC-like cells can be isolated from the adult mouse kidney. (A) Cells were isolated by FACS from the renal cortex of 6- to 8-week-old male C57BL/6 mice and stained with typical adult tissue stem cell/progenitor cell markers (CD44, c-Kit, CD90, and CD105) to evaluate their expression. Representative data are presented, and percentages of double-positive cells versus total CD44+ cells are indicated. (B) Typical MSC surface markers expressed in isolated CD44+ cells after three to five passages in culture as analyzed by FACS. (C) Mouse renal CD44+ or CD44− cells were assayed for clonogenicity using the colony forming unit (CFU) assay. Left panel shows the quantification of CFU formation after 14 days in culture as measured by Giemsa staining and microscopy. Representative CFU images acquired by light microscopy (middle and right panels; original magnification, ×10). (D) Multilineage differentiation capacity of renal CD44+ cells. Renal CD44+ and CD44− cells were isolated and cultured for three to five passages before the induction of differentiation. Left panels: Images of cells cultured in adipogenic induction medium for 2 weeks, showing oil red–stained lipid droplets. Middle panels: Images of cells cultured in osteogenic induction medium for 3 weeks. Alkaline phosphatase staining (red). Right panels: Images of CD44+ and CD44− cells after 6 days of induction toward smooth muscle lineage. Expression of the SMC specific marker α-smooth muscle actin (αSMA) is shown in red. Original magnification, ×20. After selection for the CD44 marker and three to five passages in culture, cells appeared homogeneous and exhibited a spindle-like shape typical of MSCs (Supplemental Figure 1A). In culture, the cells lost the expression of c-Kit and CD90 but maintained the expression of typical MSC markers, such as CD44, CD105, CD73, and CD51 (Figure 1B and Supplemental Figures 1B, 2A, and 2C). As expected for MSCs, the cultured cells did not show expression of hematopoietic lineage markers or endothelial markers (Supplemental Figure 1B). Further immunophenotyping analysis for MSC markers indicated that the isolated cells were very similar to tissue MSC-like cells recently identified in the heart and other tissues11 (Supplemental Figure 2A), reflecting their progenitor cell phenotype. The CD44+ MSC-like cells also expressed typical markers of the metanephric mesenchyme, such as Eya4, Sox11, Id2, and Foxd112 (Supplemental Figure 2B). To further define the isolated CD44+ MSC-like cells, we performed an in vitro colony-forming assay first used to characterize bone marrow MSCs.11,13 Limit dilution assays with CD44+ cells yielded several colonies per well, whereas no colonies were observed in the CD44− cells (Figure 1C). Expression profiling of the individual clones showed that they were homogeneous for the expression of markers tested and that their profile was very similar to the profile shown in the CD44+ cells from the noncloned cultures (Supplemental Figure 2C). Importantly, these clones highly expressed several MSCs as well the embryonic mesenchyme markers (Pax2, Sox11, Foxd1), but exhibited low or undetectable expression of pericyte or JG cell markers (Supplemental Figure 2C). Cultured renal CD44+ cells also possessed the capacity for multilineage differentiation. Indeed, following established conditions14,15 adult renal CD44+ MSC-like cells could be stimulated to transdifferentiate toward the adipogenic, osteogenic, or smooth muscle cell lineages (Figure 1D). Neither untreated CD44+ cells nor renal CD44− cells showed evidence of differentiation to any of the above-mentioned lineages under the conditions tested (Figure 1D and Supplemental Figure 3). 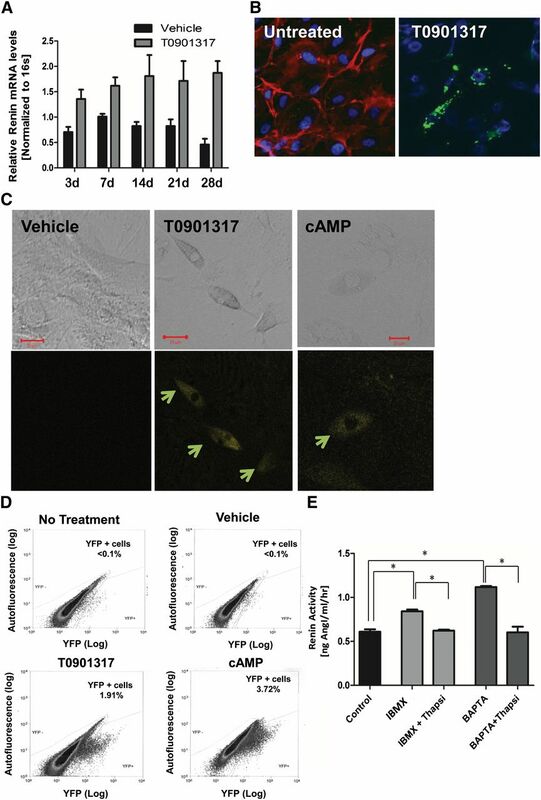 We showed previously that bone marrow–derived MSCs can be induced to differentiate into renin-expressing cells after activation of the LXRα/cAMP pathway.5 To assess whether renal CD44+ MSC-like cells have similar capacities, cells were treated with known regulators of renin expression, such as cAMP (1 mM), 3-isobutyl-1-methylxanthine (IBMX) (0.1 mM), IBMX (0.1 mM) plus 22-hydroxycholesterol (22-HOC) (0.1 μM), and the LXRα synthetic ligand T0901317 (1 μM).16,17 As shown in Figure 2A, treatment with LXRα agonist T0901317 resulted in a significant increase in renin mRNA expression in CD44+ cells. Similar results were seen in response to cAMP, IBMX, or IBMX plus 22-HOC (Supplemental Figure 4, A and B). Consistent with these data, protein analysis using a renin-specific antibody revealed renin-positive cells in the CD44+ population after treatments with cAMP, 22-HOC, or T0901317 (Figure 2B and Supplemental Figure 4B). Renin-positive cells were not found in CD44−cells with the same treatments, nor were they found in CD44+ cells treated with vehicle alone or CD44+ cells at baseline (Figure 2B and Supplemental Figures 2C, 4B, and 4C). During the differentiation process, the renal MSC-like cells gradually lost the CD44+ expression (Figure 2B and Supplemental Figure 4D). Mouse renal CD44+ MSC-like cells can differentiate into renin producing JG-like cells in vitro. Renal CD44+ and CD44− cells were isolated from adult male mice and cultured in growth medium for three to five passages before use. (A) Quantitative RT-PCR analysis of CD44+ cells treated with T0901317 (1 µM) (gray bars) or vehicle (black bars), n=3 in each group. Data are presented as the mean ± SEM. P=.0004 for treatment (two-way ANOVA). (B) High magnification (40×) confocal images showing double-staining for CD44 (red) and renin (green) in renal CD44+ cells treated with T0901317 for 4 weeks. Note the granular pattern, typical of renin expression. CD44 expression (red) decreased or disappeared during the differentiation process. Untreated; differentiation day 0; n=5. (C) Representative confocal images (32×; scale bar, 20 µm) of C57BL/6 Ren1C YFP mouse renal MSC CD44+ cells treated for 21 days with cAMP (1 mM), T0901317 (LXRα ligand, 1 μM), or DMSO (vehicle). YFP (yellow) is used as a surrogate marker for renin expression (arrows). (D) FACS analysis of renal CD44+ cells treated with DMSO (vehicle), T0901317 (LXRα synthetic ligand, 1 µM), or cAMP (1 mM) or no treatment for 21 days. Representative data are shown, n=7. (E) Renin activity in the medium of the differentiated cells induced by T0901317 for 2 weeks, followed by the stimulations with IBMX, or the [Ca2+]i chelator BAPTA-AM, with or without thapsigargin (thapsi). Data are presented as the mean + SEM, n=8. *P<0.05 for all group comparisons indicated (one-way ANOVA with Bonferroni multiple comparison test was used). To further validate these findings, CD44+ MSC-like cells were isolated from kidneys of male C57BL/6 transgenic mice harboring yellow fluorescent protein (YFP) under the control of the renin promoter (Ren1c-YFP).18 In this experimental setting, expression of YFP acts as a surrogate marker for renin expression.18 YFP expression was detected as early as 1 day after treatment with LXRα, cAMP, or IBMX, and the increase in expression was sustained throughout the treatment period, peaking at day 21 (Figure 2C). Among the conditions tested, treatment with LXRα ligand or cAMP was the most effective at inducing YFP expression (Figure 2D). These data show that the adult kidney-derived MSC-like cells have the capacity to differentiate into renin-producing cells. JG cells are characterized by the presence of renin granules with unique secretory properties. Immunocytochemical confocal analysis with renin-specific antibodies of CD44+ MSC-like cells treated with T0901317 for 4 weeks revealed that renin was not distributed diffusely throughout the cell but instead was localized in a discrete, granular pattern, suggesting its presence in granules (Figure 2B). To further define these cells as JG-like, we examined whether active renin can be released from these cells and determined the specific effects of calcium on renin secretion. Unlike most other secretory systems, renin secretion from JG cells is uniquely inhibited by increases in intracellular calcium because of calcium inhibition of adenyl cyclase and calcium-activated phosphodiesterase.19–21 Similar to JG cells, IBMX and 1,2-bis(2-aminophenoxy)ethane-N,N,N′,N′-tetraacetic acid-tretrakis (Acetoxymetil ester) (BAPTA-AM) significantly increased renin release from the CD44+ derived renin cells, while thapsigargin inhibited renin release induced by IBMX or BAPTA-AM (Figure 2E). Preincubation of the collected media with renin-specific neutralizing antibody abrogated the generation of angiotensin I, indicating that the angiotensin I levels were due to renin and not to nonspecific proteases. Overall, these data demonstrate that renin-producing cells derived from renal CD44+ MSC-like cells share the unique phenotype of native JG cells. The preceding data demonstrated that renal CD44+ cells have the capacity to differentiate into renin-producing cells with JG cell–like characteristics in vitro. To evaluate whether the renal CD44+ cells show the same capacity in vivo, we used in vivo cell tracking methods. For this, Q dot–labeled cells isolated from transgenic adult male C57BL/6 Ren1c-YFP mice were injected into the renal artery of C57BL/6 wild-type mice preconditioned with a sodium-deficient diet for 2 days. After injection, the mice were kept on a low-salt diet for 3 days, followed by 5 days of a low-salt diet combined with captopril treatment to induce JG cell recruitment. Kidneys were then removed and the presence of engrafted CD44+ MSC-like cells (Q-tracker–positive cells) and renin expression (YFP+ cells) were evaluated using multiphoton microscopy. Animals without any injection of CD44+ cells and animals injected with PBS or CD44+ cells kept on normal chow diet were used as controls. As shown in Figure 3, Q dot–positive cells (red) were detected in sections from kidneys, 8 days after injection, indicating that the cells were successfully engrafted in the kidney. Of note, cells expressing YFP (green) were detected in the kidneys from the low-salt/captopril–treated animals but not in the kidneys of the animals kept on a normal diet. This finding reveals the capacity of the CD44+ MSC-like cells to differentiate into renin-producing cells under conditions that promote JG cell recruitment in vivo (Figure 3). Note that the presence of YFP (surrogate for renin)-expressing cells could be explained only by the presence of renin-positive cells derived from the injected CD44+ MSC-like cells isolated from the C57BL6 Ren1c YFP mice (Figure 3). These results strongly support the ability of adult renal MSC-like cells to differentiate into renin-expressing cells in vivo. Mouse renal CD44+ MSC-like cells can differentiate into renin producing JG-like cells in vivo. Q Dot (red) prelabeled mouse renal CD44+ cells from C57BL/6 Ren1c YFP transgenic mice injected into renal artery of wild type mice. Mice were kept on normal chow diet or low-salt diet and captopril treatment as described in the Material and Methods section. (A) Isosurface rendering of representative multiphoton microscopy images (25×) from the kidneys after three-dimensional reconstruction using Imaris software showing nuclei (blue), and YFP (shown as green) and Q Dot (red) in the kidney of normal chow diet control mice and low-salt/captopril (Capt)–treated animals; scale bar, 50 µm. (B) Isosurface rendering of representative multiphoton microscopy images (25×) in low-salt/captopril–treated mice. White arrows point to Q dot–positive cells and red arrows point cells double positive for Q dot and YFP. Boxed area highlights the presence of YFP (renin)-expressing transplanted Ren1c YFP CD44+ cells in the glomerulus (G) area. Note that the presence of YFP could be attributed only to the injected Ren1c YFP CD44+ MSCs; Q dot labeling serves as a secondary control for the engraftment of injected cells. To investigate the physiologic importance of the endogenous renal MSC-like cells, we next examined their potential role in JG cell recruitment in vivo. 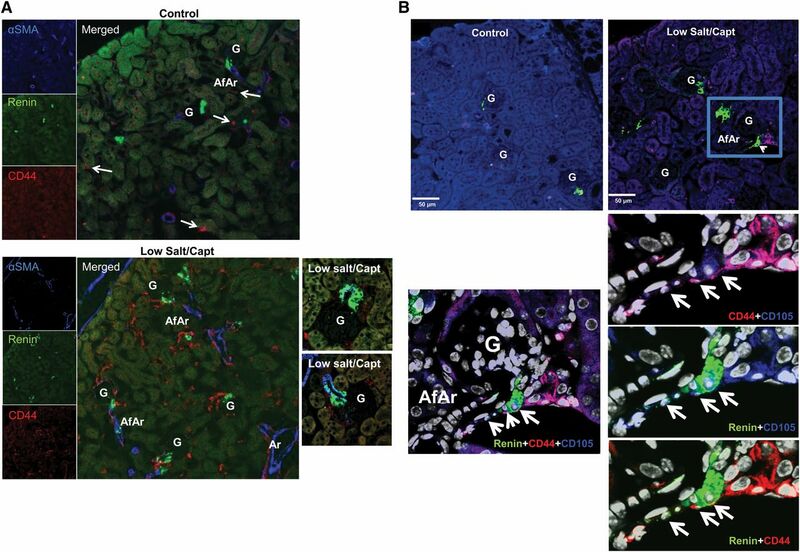 As anticipated, treatment of adult male mice with low-salt/captopril–induced JG cell recruitment resulted in a three- to seven-fold increase in renin expression and expansion in the distribution of renin-producing cells in the kidney compared with that observed with mice receiving a normal-salt diet/vehicle (Figure 4A and Supplemental Figures 5A and 6). Staining for CD44 in renal sections revealed that JG cell recruitment was accompanied by an expansion in the number of CD44+ cells in the adult kidney (Figure 4A). These cells did not express the epithelial marker CD31 (PECAM-1), but a considerable fraction of them expressed the stem cell markers c-Kit, CD90, and CD105, as well as occasionally platelet-derived growth factor receptor-β, which has been associated with both adult progenitor cells11 and pericytes (Figure 4B and Supplemental Figure 5B). To confirm and quantify this increase, we performed FACS analysis of renal cells isolated from mice on a normal-salt or low-salt/captopril diet using CD44 and/or c-Kit–specific antibodies. The results showed that the percentage of CD44+ cells or CD44+/c-Kit+ increased approximately two- to four-fold in the kidneys from the low-salt/captopril–treated group (Supplemental Figures 7A, 8A, and 9B). Additional CD44+ MSC-like markers, such as CD90 and CD105, were also increased by approximately two- to three-fold, as evidenced by parallel FACS analysis (Supplemental Figure 7A). Collectively, these data strongly suggest that the CD44/c-Kit markers identify a heterogeneous progenitor cell population in the adult kidney that is activated under conditions that promote JG cell recruitment. Mouse renal CD44+ MSC-like cells contribute to JG cell recruitment. C57BL/6 wild-type or Ren1c YFP male mice (6–8 weeks old) were administered a low-salt/captopril or normal diet for control, as described in the Material and Methods section. (A) Representative 14× confocal images of kidney sections stained with α-smooth muscle actin (α-SMA; blue), CD44 (red), or renin (green) from control and treated mice. Upper panel: control untreated mice; lower panel: low-salt/captopril (Capt)–treated mice. Magnifications highlighting the presence of renin-positive CD44 cells in low-salt/captopril–treated mice are shown in the right. AfAr, afferent arteriole; Ar, artery; G, glomeruli. White arrow points to CD44+ cells under basal conditions. (B) Upper: Representative 14× confocal images of kidney sections stained with CD105 (blue), CD44 (red), or renin (green) from control and treated mice as in A. Lower: Magnifications from above highlighting the coexpression of CD105 and CD44 markers with renin (arrows). (C) Left: Representative images (16×) of kidney sections from low-salt/captopril–treated Renin1c-YFP animals, highlighting the presence of double-positive CD44 (red)- and YFP (green)-expressing cells. Right panels show zooms (magnification, ×40) to specific areas with CD44 and YFP double-positive cells (arrows). (D) Three-dimensional reconstruction of confocal microscopy images (magnification ×40) of kidney sections from Ren1c YFP mice treated with low-salt/captopril using Imaris software. Arrows show cells that coexpress CD44 and YFP. Note that the CD44 staining localizes to the cell membrane and YFP is cytosolic. Right: Three-dimensional projection of same image as C, allowing detection of yellow color denoting coexpression of CD44 and YFP in the cells. (E) FACS analysis of isolated mouse kidney cells using anti-CD44 antibody, and YFP expression. The bar graph in the left presents the percentages of YFP+ and CD44+/YFP+ double-positive cells versus total cells in the kidneys of control and low-salt/captopril–treated mice. Data presented as the mean and SEM; *P<0.05 low-salt/captopril mice versus control. The individual sample values for the CD44+/YFP+ represented as percentage of double-positive CD44+/YFP+ cells versus total YFP+ cells (renin-expressing cells) are shown at the bar graph in the boxed area. In the kidneys of mice with JG cell recruitment, besides the expanded presence in the interstitium, cells expressing the MSC markers were also concentrated along and close to the afferent arterioles in a manner similar to the pattern of renin expression observed under JG cell recruitment (Figure 4, A and B). Importantly, co-localization of MSC markers with renin was also observed (Figures 4, A and B). Indeed, as shown in Figure 4B, renin-expressing cells that were double positive for both CD44 and CD105 could be detected in the JG area and the afferent arteriole. It is important to note that this pattern was observed only after stimulation, and expression of CD44 or CD105 was not observed in the JG area under normal conditions (Figure 4B, sections from control kidneys). To further confirm the presence of double-positive CD44+/renin-positive cells after low-salt/captopril treatment, we performed immunofluorescence microscopy analysis of FACS-isolated CD44+ cells (Supplemental Figure 7B). To further investigate the contribution of renal progenitors contribution to JG cell recruitment and to confirm coexpression of the CD44 marker with renin, adult male Ren1c YFP mice received low-salt/captopril treatment to induce JG cell recruitment. As shown in Figure 4, C and D, double-positive cells expressing CD44 and YFP were detected in mice under treatment. 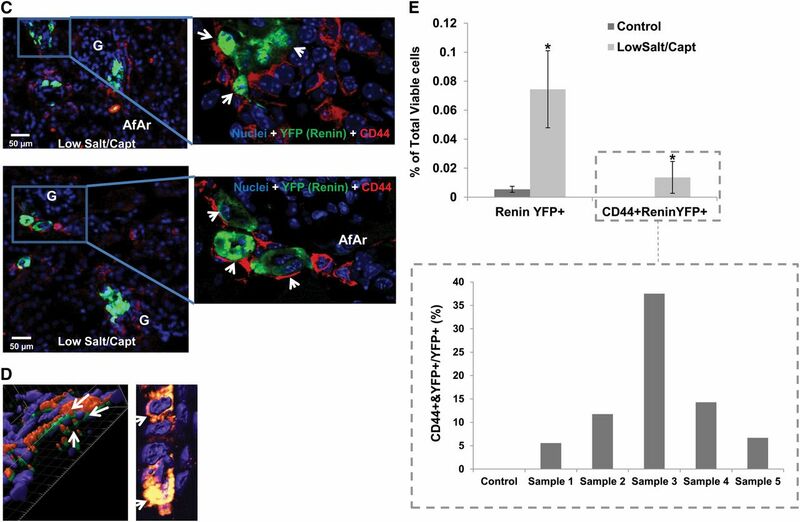 FACS analysis, as well as quantitative analysis of confocal immunofluorescence images, showed that double-positive CD44+/YFP+ cells accounted for 5%–35% total renin-expressing cells in the kidney (Figure 4E and Supplemental Figure 8A). CD44+/YFP+ cells were not detected in control, untreated mice (Figure 4E and Supplemental Figure 8A). Similar results were observed for CD44+/c-kit+ cells in an alternative in vivo model of sodium restriction using low salt and furosemide in place of low-salt/captopril treatment (Supplemental Figure 9). Again, c-Kit was found to co-localize with renin expression only after stimulation and was not detected in JG cells isolated from normal kidney (Supplemental Figure 10). These data indicate that during JG cell recruitment, CD44+ MSC-like cells in the adult kidney are activated and contribute to the increase in renin-expressing cells. To provide definitive evidence for the involvement of renal MSC-like cells in JG cell recruitment in vivo, we performed Cre-recombinase lineage tracing. For this we generated c-KitCre-ERT2 green fluorescent protein (GFP)/Rosa transgenic mice. In these mice, all cells are marked with the tdTomato fluorescent protein, whereas tamoxifen treatment causes Cre-mediated recombination and specific marking of c-Kit+ cells and their descendants with GFP. Tamoxifen was administered to the c-KitCre-ERT2 GFP/Rosa tdTomato transgenic mice for 3 days to induce Cre-mediated recombination, followed by normal diet/vehicle or low-salt/captopril treatment for 10 days to induce JG cell recruitment. After treatments, kidneys were perfused and expression of GFP and tomato was analyzed by multiphoton microscopy. 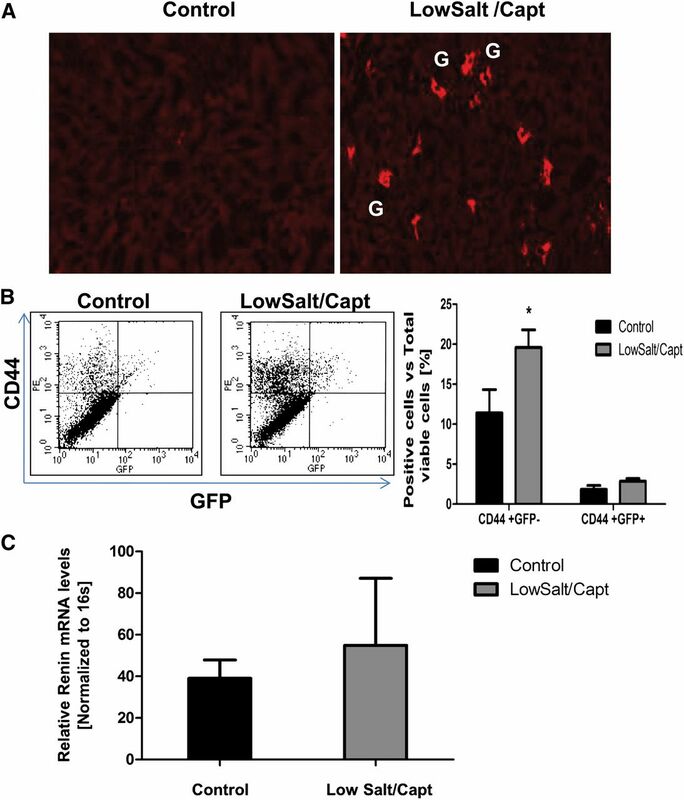 As expected from our previous experiments, animals receiving low-salt/captopril treatment showed an increase in the expression of GFP compared with the control mice receiving normal chow diet, indicating an expansion of c-Kit+ progenitor cells during JG cell recruitment (Figure 5A). Further analysis using renin immunostaining and confocal microscopy revealed that a fraction of the GFP+ cells also expressed renin (Figure 5B). Additional image processing steps (i.e., different plane views, clipping plane reconstructions, and signals profiling) taken to ensure that the yellow signal was not due to “cell stacking” effects, confirmed true coexpression of the c-Kit (green) marker with renin (red). The preceding data further support the capacity of c-Kit+ renal MSC-like cells to differentiate into renin-expressing cells and for their potential contribution to the increase of renin-producing cells observed under conditions of JG cell recruitment. Lineage tracing confirms contribution of adult renal c-kit+ MSC-like cells to JG cell recruitment. c-KitCre-ERT2 GFP/Rosa tdTomato mice were treated with tamoxifen, followed by low-salt/captopril treatment, as described in the Materials and Methods section. (A) Isosurface rendering of representative multiphoton microscopy images from the kidney of treated or untreated control mice. c-Kit+ (GFP-green) and nuclei (blue). Scale bar, 50 µm. (B) Confocal microscopy images of kidney JG area from control mice or treated mice; c-Kit lineage cells (GFP-green), renin (red), and nuclei (blue). Orthogonal slides of three-dimensional (3D) reconstructed images at all three different planes allows visualization of coexpression of fluorescence signals renin (red) and GFP (green), ensuring that the yellow signal is not due to cell stacking. (Original magnification, 40× in X-Y, X-Z and Y-Z planes.) Below orthogonal slide: Imaris 3D clipping plane reslicing of the low-salt/captopril image from above showing coexpression of GFP and renin inside the cells is presented. Panels show merged signal (yellow). (C) Top: Representative orthogonal slides of 3D reconstructed image from low-salt/captopril–treated kidney showing an area of cells coexpressing renin with c-Kit. Bottom: Confocal microscopy image (×20) from selected area from above and signal profile analysis for nuclei (blue), c-Kit (green), and renin (red) allowing for detection of cells coexpressing renin and CD44 in the area. (Specific places were blue, green, and red localized to the same place on the image, highlighted by arrows). The preceding data highlight the involvement of endogenous renal CD44+ cells in JG cell recruitment after low-salt/captopril treatment. Still, bone marrow–derived progenitors could explain the presence of adult tissue stem cells, particularly under pathophysiologic conditions. To investigate the potential contribution of bone marrow–derived cells to the pool of renal CD44 cells, we transplanted GFP+ bone marrow cells into total-body–irradiated wild-type mice, followed by low-salt/captopril treatment for 10 days. The latter treatment resulted in JG cell recruitment in both control mice and mice with irradiation/bone marrow transplantation (Figure 6A). The GFP+ bone marrow cells reestablished the bone marrow niche because GFP+ cells (98% of which also coexpressed CD44) could be detected in the kidney of both control and low-salt/captopril–treated animals at similar levels. Importantly, GFP+ cells showed no contribution to renin-producing cells (Figure 6, B and C). 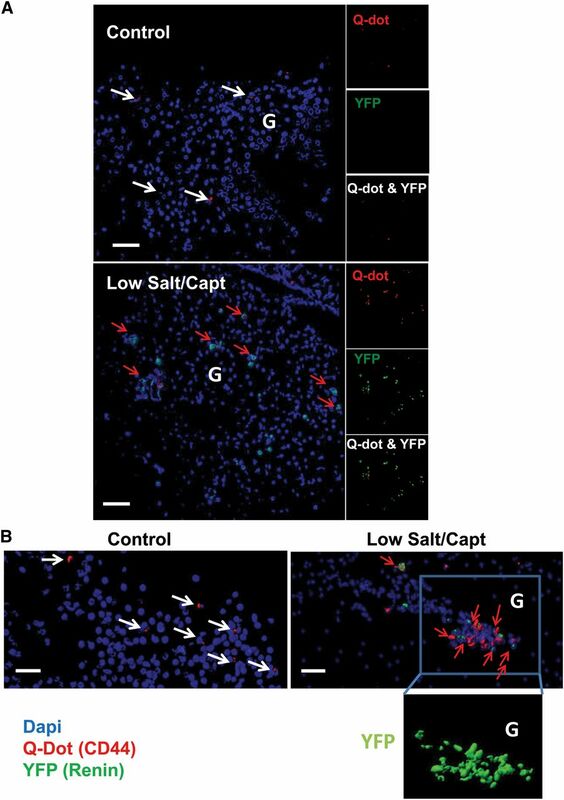 In contrast, low-salt/captopril treatment resulted in an increase of endogenous CD44+/GFP− cells in the kidney, accompanied by an increase in their expression of renin (Figure 6, B and C), indicating that the CD44+ cells activated are nonhematopoietic cells intrinsic to the adult kidney. In summary, our experiments suggest that renal CD44+ cells contributing to JG cell recruitment are not recruited from extrarenal sources but reside in the adult kidney. MSC-like cells participating in JG cell recruitment represent resident progenitor cells of the adult kidney. Bone marrow transplantation was performed with GFP-transgenic mice as donors and wild-type mice as recipients, followed by low-salt/captopril treatment or normal diet for 10 days. (A) Representative immunofluorescence (original magnification, 10×) of five independent experiments staining for renin (red) in kidneys from control and treated animals. G, glomerulus. (B) FACS analysis of CD44 (phycoerythrin–labeled) and GFP+ or GFP− cells in kidney of mice with bone marrow transplantation after low-salt/captopril treatment or normal chow diet. (C) Renin mRNA expression determined by real-time PCR in GFP+ cells from kidneys of mice with bone marrow transplantation under low-salt/captopril treatment or normal diet as control. Data presented as the mean + SEM of five independent experiments; *P<0.05 treated versus control. Here, we present evidence that adult renal MSC-like cells have the capacity to differentiate into renin-producing cells with JG-like cell characteristics in vitro. Importantly, our data provide the first evidence that progenitor cells in the adult kidney are stimulated during JG cell recruitment. In our experiments, CD44+ or c-Kit+ cells in the kidney expanded after low-salt/captopril or low-salt/furosemide treatment and localized to the JG area, suggesting that CD44+ cells were activated during JG cell recruitment. Indeed, a subpopulation of the newly induced renin-expressing cells were positive for the CD44+, c-Kit+, and/or CD105 markers. Coexpression of renin with these progenitor/stem cell markers was observed only after stimulation with low-salt/captopril treatment or low-salt/furosemide treatment and was not found in JG cells under normal conditions. Further, lineage tracing approaches using direct injection of the progenitor cells into the kidney, as well as mouse transgenic models to mark and monitor those cells in vivo, provided direct evidence of the capacity of those cells to differentiate into renin-producing cells and to participate in JG cell recruitment under conditions of sodium restriction in vivo. The present study supports a novel mechanism of progenitor cell contribution to the renin response to sodium depletion and highlights a new physiologic role for adult renal progenitor cells. During development, MSC precursors give rise to renin progenitors that differentiate into JG cells but also can give rise to renal arteriolar smooth muscle cells that can re-express renin in the adult kidney when homeostasis is threatened.18 Our data support the hypothesis that in addition to re-expression of renin in SMCs, JG cell recruitment of resident renal mesenchymal stromal cells recapitulates developmental processes, giving rise to new renin-expressing cells. The relationship between the progenitor cell mechanism proposed here and the concept of arteriolar smooth muscle transdifferentiation,2–4 and how these two processes interplay to increase renin expression during JG cell recruitment, is currently unclear. It is possible that the CD44+ cells express α-smooth muscle actin before committing to the renin phenotype, or that they might represent a completely different homeostatic mechanism in the kidney. The relative contribution of transdifferentiation of arteriolar vascular smooth muscle cells versus renal MSC contribution to JG cell recruitment is not clear. It is likely that several mechanisms may contribute to JG cell recruitment, and, at the moment, transdifferentiation of arteriolar vascular smooth muscle to the JG cell phenotype seems to be the dominant mechanism, with renal MSC contribution accounting for a lower percentage of the newly induced renin-expressing cells (about 10%). Future experiments to address the physiologic importance of this mechanism and the signaling pathways involved are needed. Intriguingly, our data show that the CD44 marker identifies a heterogeneous progenitor cell population in the adult kidney. These cells coexpress additional MSC markers, such as c-Kit, CD90, and CD105, and are negative for CD31, at least under control conditions. A subpopulation of these CD44+ cells also express platelet-derived growth factor receptor-β.22 Given recent results suggesting that vascular pericytes give rise to multilineage stem cells in adult organs, it would be of value to investigate the relationship between the CD44+ population and the vascular pericytes in the adult kidney and their contribution to renin cells.22 Moreover, we cannot exclude the possibility that exposure to the kidney environment created by sodium depletion might activate dormant facultative cells with the ability to transition from one state to another via the activation of MSC markers. However, the presence of such a facultative progenitor is speculative. Interestingly, isolated murine renal CD44+ MSC-like cells under prolonged stimulation with LXRα ligand in vitro not only upregulate renin expression but also differentiate into cells that exhibit characteristics typical of JG cells. These results strongly suggest that the nuclear hormone receptor LXRα may be an important modulator of the JG cell phenotype and potentially a key element in the transcriptional programming for JG cell lineage. In that regard, Pentz et al.23,24 have shown that histone acetyl transferases CREB-binding protein (CBP) and p300 are important for renin expression as well as for the transformation of smooth muscle cells to the renin phenotype, implicating epigenetic mechanisms in the regulation of the JG cell identity. In addition, recent studies have also highlighted the role of microRNAs in controlling renin expression.25 Indeed, Medrano et al. have shown that under conditions that stimulate reacquisition of the renin phenotype in the kidney, miR-330 and miR125b-5bp define renin-expressing cells by having opposite effects. It will be worthwhile therefore to investigate whether LXRα can modulate some of these factors. In addition, given the lack of in vitro systems to study JG cell differentiation, the renal CD44+ MSC differentiation model can be potentially used to further our understanding of the signaling pathways involved in the development of the JG cell fate. In summary, our results document the existence of CD44+ MSC-like cells in the adult kidney that can differentiate into JG-like renin-producing cells and contribute to the increase in renin-producing cells under JG cell recruitment conditions. These findings provide new insights into the processes involved in JG cell recruitment and open new avenues to our understanding of the role of renal progenitor cells/stem cells in renal physiology and disease. Adult male C57BL/6 wild-type mice (Charles River Laboratories), C57BL/6-Tg(UBC-GFP)30Scha/J mice (Jackson Laboratory), Friend Virus B NIH Jackson strain (FVB), and FVB overexpressing Chicken Beta Actin Promoter driven Enhanced Green Fluorescence Protein (ACTB-EGFP) B5Nagy/J (Jackson Laboratory), C57BL/6 Ren1c-YFP mice (kindly provided by Dr. Gomez at the University of Virginia Medical Center) were used. C57BL6 c-KitCre-ERT2 GFP/Rosa tdTomato mice (tdTomato transgenic mice, which carry a Cre-ERT2 expression cassette inserted into the ATG start codon of the endogenous c-kit locus, were generated by homologous recombination). All animal procedures were conducted in accordance with the guidelines for the care and use of laboratory animals of Duke University. Kidneys were perfused with saline, harvested, minced, and digested with collagenase type I. Renal CD44+ cells were isolated by FACS. An isotype antibody was used to distinguish nonspecific antibody binding, and the dead cells were excluded using 7-amino-actinomycin D dye. Doublets were excluded on the basis of three hierarchical gates (forward/side scatter area, forward scatter height/width, and side scatter height/width). After FACS, CD44+ cells were post-sorted to ensure that the isolated population consisted only of viable renal CD44+ cells. Isolated cells were cultured in growth medium MesenPRO RS medium (Invitrogen). Wild-type male C57BL/6 mice (6–8 weeks old) were fed a low-salt diet or normal chow diet for 2 days before MSC injection. At day 2, mice were anesthetized and 1×106 Q dot–labeled renal CD44+ MSCs from C57BL/6 Ren1c-YFP mice were injected via the renal artery. After injection, mice were kept for 3 more days on a low-salt diet, followed by captopril treatment for 5 days. Control animals were kept on a normal chow diet. After treatments, kidneys were perfused, harvested, embedded in optimal cutting temperature compound (Sakura Finetek) and frozen. The expression of YFP and Q dot was determined using multiphoton microscopy with an Olympus BX61WI microscope. Cells were labeled with Q dot (Invitrogen). C57BL6 c-Kit Cre-ERT2 GFP/Rosa tdTomato male mice were treated with tamoxifen for 3 days to activate Cre. Then, mice were fed a low-salt diet combined with captopril treatment or normal chow diet/vehicle for 10 days. After treatments, kidneys were perfused, harvested, embedded in optimal cutting temperature compound (Sakura Finetek), and frozen. The expression of GFP (c-Kit lineage) was determined using multiphoton microscopy with an Olympus BX61W1 microscope. Kidney sections were cut and processed for immunocytochemistry using GFP, as well as renin-specific antibodies and analyzed in a LSM 510 meta confocal microscope from Zeiss. All the results are presented as the mean ± SEM. P values were analyzed by two-way ANOVA for the analysis of the relative renin expression for the in vitro differentiation experiments; one–way ANOVA with Bonferroni multiple comparison test was used to calculate P values in the renin activity test. The rest of the results are presented as the mean ± SEM and the data were analyzed using an unpaired t test. Power analyses for sample size results are presented in Supplemental Table 2. All statistical analyses were performed using GraphPad. V.J.D. has relationships with Alnylam Inc. and Medtronic. The remaining authors report no conflicts. We thank the members of our laboratory, especially Alan Payne, Tilanthi Jayawardena, and Conrad Hodgkinson, as well members of Dr. Thomas M. Coffman’s laboratory, for helpful discussions. Also sincere thanks to the FACS core facility at Duke University for helping with the FACS data and Dr. Sam Johnson in the Light Microscopy Core Facility at Duke University for his technical support in using the multiphoton microscope and Imaris software. Finally, special thanks to Professor Ariel Gomez for kindly proving the Renin YFP mice, Dr. William Beierwaltes and his laboratory for helping with the measurements of plasma renin concentration, and Dr. Marcela Herrera for helping with the animal studies. Research conducted in these studies was supported by National Heart, Lung, and Blood Institute grants R01 HL35610, HL81744, HL72010, and HL73219 (to V.J.D. ); the Edna Mandel Foundation (to V.J.D. and M.M. ); and the Foundation Leducq (to V.J.D.). M.M. is also supported by an American Heart Association National Scientist Development Award (10SDG4280011). H.W. and J.A.G. have contributed equally to this work. This article contains supplemental material online at http://jasn.asnjournals.org/lookup/suppl/doi:10.1681/ASN.2012060596/-/DCSupplemental.